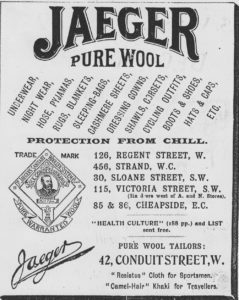 Jaeger, which was originally a pioneer British outdoor brand, went into administration on 10 April 2017, after 133 years of trading. A recent article showed how Jaeger lost its way. Through its long history its focus shifted from function to fashion, but quality and design lay at its heart, embedded in the DNA of the brand and coming from the product teams that understood their customers and their need.When that intertwining of knowledge, values, passion and expertise were lost, as it has been in recent years, the brand ran into serious difficulties and lost its way. So where did this DNA in Jaeger originate? ‘Jaeger is clothing, rugs, blankets and knitting wool made of the highest quality ed camel hair sleeping bags to explorers and mountaineers,provided an important plank upon which the company built their brand. The Norwegian polar explorer Fridtjof Nansen dressed exclusively in the light woollen clothing advocated by Dr Jaeger and Jaeger undergarments were also used by Ernest Shackleton in the Antarctic. Jaeger, which along with Burberry and Grenfell can be identified as one of the UK’s first outdoor brands. Jaeger was a warm wear specialist (forerunner of Polartec ) and Burberry and Grenfell can be likened to Gore-Tex. Jaeger began to shift from being a functional to a fashion brand just before the First World War. It achieved this change by building on the skills and knowledge within the company, rather than destroying them. From using camel hair for sleeping bags they began making stylish camel hair coats with the continued emphasis on quality. Fundamental change in a brand was achieved by building on knowledge and bringing new expertise whereas destroying a brand’s DNA is usually a recipe for disaster.